I managed to find a really affordable website called wrappz. The website offers custom made laptop and phone skins that are a simple and extremely easy way of jazzing up your boring laptop and covering any unnecessary scratches. 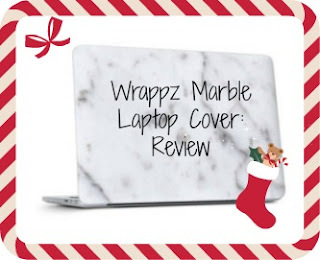 The lovely guys over at Wrappz very kindly offered to send me a custom made laptop skin, so I decided to search the internet for a marble background (as this is the look and uploaded it to the desired size template. My laptop skin was sent within 2 working days and came well packaged with signed for delivery. I was really pleased with the quality of the skin as I was aprehensive that the skin would go on bubbly and would start to peel easily, however I am amazed at just how easy it was to apply to my laptop. When opening up the website, you firstly select whether you want to choose a laptop skin or a phone skin. You choose the laptop size and style and then basically upload pictures to it and type text. I am so pleased with how it looks and I absolutely love it! I will 100% be going back to the website to purchase my very own custom made IPhone skin! Do you guys like it? I am so pleased to be able to tell you that the lovely people at Wrappz have given me a special discount code just for YOU!! They are offereing my readers the chance to get your own FREE phone skin! All you have to do is head over and design your own and then enter the code freeskin. All you will have to pay for is your postage. Wrappz have also given me a discount code to give you for a laptop skin too! If you would like £5 off your laptop skin, then simply enter the code laptop. There is a huge selection of skins to choose from, or you can make your own personal design. If any of you decide to purchase a laptop skin or phone skin, please let me see them by tweeting me or commenting below :) Enjoy! * I was very lucky to be send this skin for free in exchange for a review on my blog, however all opinions are my own.